China's frigate Huangshan is seen anchored in the waters off RSS Singapura Changi Naval Base Monday, May 15, 2017, in Singapore. More than 40 ships conclude drills with display of seamanship. The Chinese navy appears to have conducted a huge naval exercise in the South China Sea over the past week, capped off by an impressive formation of warships. The exercise comes on the heels of numerous high-profile training and engagement events in the region by the United States and other extraregional navies. Satellite images obtained by Reuters show over 40 naval vessels assembled near Hainan iIsland. The gathering of warships appears to be one of the largest that the People’s Liberation Army Navy (PLAN) has ever assembled and included submarines, a variety of surface combatants, and the aircraft carrier Liaoning. The exercise follows a number of high-profile engagements in the South China Sea by extraregional navies. At the beginning of March the USS Carl Vinson visited Vietnam’s port of Danang, the first U.S. aircraft carrier to visit the country since 1975. After the port visit, the carrier and its escorts conducted interoperability exercises with one of the Japanese Maritime Self-Defense Force’s largest warships in the South China Sea. Around the same time, the HMS Sutherland patrolled the South China Sea, the first British warship deployed to the the region in years. 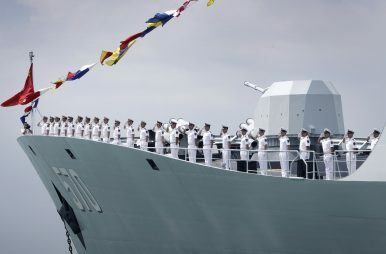 Around the same time that the Chinese fleet was beginning its exercises, U.S. officials revealed that a destroyer, the USS Mustin, conducted a Freedom of Navigation Operation near Mischief Reef, site of a massive Chinese base built on reclaimed land in the Spratly Islands. The timing of the Carl Vinson’s visit and the Sutherland’s patrol have been known publicly for some time, which may have influenced the scheduling of the Chinese exercise, but it is unlikely that it was conducted exclusively as a response to those events. The Liaoning has conducted exercises in the South China Sea over December and January each of the last two years. The carrier also spent time in the South China Sea last summer, where it participated in China’s celebration of the 20th anniversary of Hong Kong’s handover from Great Britain. Additional photographs from Planet Labs, the commercial satellite imagery firm that captured the event, show the Chinese vessels steaming in two long columns led by 10 submarines traveling on the surface, followed by surface combatants, with the Liaoning and another large vessel, possibly an oiler or other support ship, in the middle, and more surface combatants. At least two large multiengine planes, probably H-6 bombers, each flanked by two smaller aircraft, appear to be over-flying the formation. Some observers dismissed the formation for being an antiquated, militarily impractical, and even “ridiculous” way to arrange warships. But the column of warships shouldn’t be interpreted as a combat exercise, but was instead likely a capstone event to the combat drills that were reported to have started last week. The U.S. and its partner navies call such capstones “Photo Exercises”; they are a way of including all participants of a major exercise, generally involve a combination of traditional warship formations, and provide public affairs opportunities to show off the exercise’s scale and the participants’ seamanship skill. The U.S. takes a long overdue step, but don't expect it to shift the needle on how China behaves in the South China Sea.